I have been wearing Adidas Adilettes ever since they were the coolest sandals to wear during my years at Beverly Hills High School (not everyone was high end there, lol). They are so simple. Rubber, contoured to the grooves of your feet, with a large strap to hold you in. Just easy, simple, and identifiable. I find it interesting that so many brands have recreated this classic Adidas look. Check out the styles I found below and let me know what you think. Loeffler Randall, who would've thunk? I love the perforation on these, adds such a simple edge. Plus, leather upper! By a Brand I don't know of called 'Religion' I found on ASOS. Same jist, artistic look? Hi Lacoste, these look like old man pool shoes. Meh. 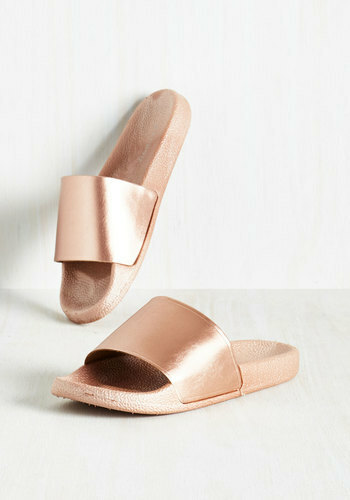 These are technically copper, but anything even close to rose gold for footwear, I love!! Surprised to find the infamous rain boot maker, HUNTER, have slide sandals! 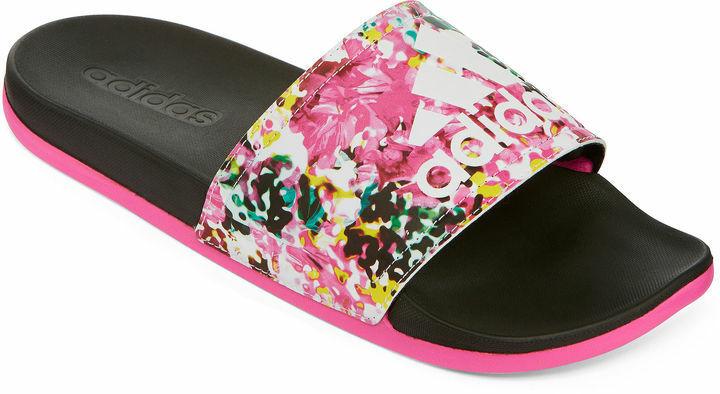 I actually really love these, especially bc of the color blocking.